The Roswell-Milton rivalry is widely-viewed as one of Georgia’s top football rivalries, as two of the state’s most esteemed and tradition-rich schools go head-to-head every year. The series record is 36-26-1 in favor of Roswell dating back to 1950. From ‘83 to 2007, the Hornets went 22-2 and largely dominated their matchups with the Eagles, but things got a bit tighter after that. The record is tied 5-5 in the past 10 years, and the two sides have played multiple close and intense games that have come down to the fourth quarter. The passion from both fan bases can be felt in the air whenever these two schools meet up, with tensions running high between both the student bodies and communities. Year-long bragging rights are on the line, as well as potential for each side to get a marquee win that can give the winning side some momentum going into regional play. Just a short bus ride away from their biggest rivals, the Roswell Hornets come into eagle territory with an undefeated record. Roswell is ranked 54th in the state of Georgia and 678th in the nation (Milton being ranked 4th in Georgia and 27th in the nation). The Hornets are coming onto the Milton field with confidence, having secured blowout wins over Campbell and Centennial and then winning a tight matchup over West Forsyth. Throughout this season, junior QB Ethan Roberts has thrown for a whopping 641 yards and 6 touchdown passes in some impressive performances. His partner in the backfield, senior Kamonty Jeff, has rushed for 331 yards, averages 5.2 yards per carry, and has 4 rushing touchdowns thus far. John Copenhaver (JR, WR) leads his team in touchdowns with a grand total of 12, 11 of the 12 being receiving. Roberts’ main go-to guy, Jacob Jarrett (Junior, Wide Receiver), has 277 receiving yards (compared to Copenhaver’s 241 yards) and 4 total touchdowns. Doneiko Slaughter (Junior, Strong Saftey and Outside Linebacker) leads the Hornets in tackles with 30 total tackles, 28 of them being solo. Tyron Hopper trails behind his teammate Slaughter, having 29 tackles, 22 of them being solo. Both Slaughter and Hopper lead their team in interceptions, each having 2. Doneiko Slaughter dominates his defensive line, once again leading his team but this time in sacks. Slaughter has six sacks, which is three times more than his fellow teammates. Roswell is coming into this rivalry with high expectations, so expect an intense game. Now ranked as 27th in the nation, Milton enters this game with a lot of momentum after reeling off 3 straight wins to start the season. The Eagles have averaged 33 points per game while holding opponents to a mere 21 points per game. On paper, with how well Jordan Yates has been as of late (682 yards, 7 total TDs through 3 games) and how solid the Milton defense has been thus far, Milton should take this win relatively comfortably. However, it is a rivalry game, and the emotions and intensity that come with it always seem to affect the outcome of this matchup. This is the biggest regular season game of the year for both sides, meaning Roswell will be bringing their A game on the road. On multiple occasions, a large underdog has won this matchup, in large part due to the different atmosphere that accompanies the game. Therefore, it is safe to assume that the Hornets are going to come into this game with a chip on their shoulder as they play against the favored Milton team and their thousands of ecstatic fans. 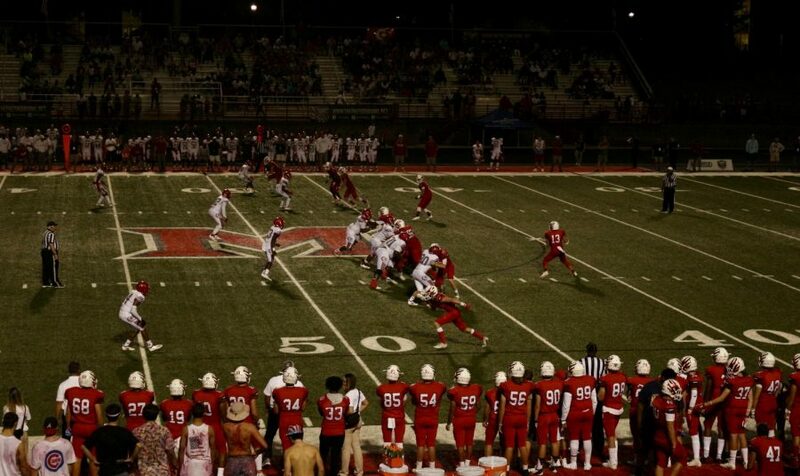 Expect a close one for much of the first half as both teams settle into the flow of the game and deal with the emotions, but Milton, after establishing their running game, should pull away late as they attack a Roswell defense which yielded 405 passing yards to Centennial earlier this season through the air.